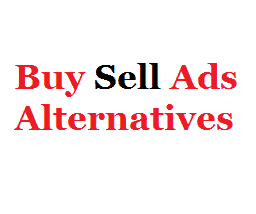 Here shared best buysellads alternatives are really helpful for those bloggers who are always in search of good income opportunities with their blogs by joining different and best ad networks. We all know that buy sell ads is at no.1 choice of maximum bloggers in the world for monthly based banner advertising because no one blogger want to have daily headache of checking per click cost and and daily up and downs of earnings from PPC ad networks. There are thousands of advertisers on buy sell ads who always use the platform for giving ads and bloggers get paid for having their advertising banners on their own blogs. If you are earning from it then its good and if you are not getting approval from buy sell ads or getting advertisers for your blog and searching for some best buysellads alternatives then you can find good options here and few of them may be from top 10 ad networks for publishers in the blogging sphere. It is one of the best marketplace for advertising and you can find so many advertisers searching for the publishers and earn good income by monetizing your monthly traffic also. This platform connect advertisers and publishers for various categories like health, technology, beauty and fashion, education etc and offers ad banners of various standard sizes which are trending in the market. Perfect platform for buying and selling of ad spaces and earning from the banners also and is your blog has good traffic amount then you can try this advertising network now. It is also among from the good ad networks which offers advertisers the great opportunity for advertise and bloggers to earn nice income and whole the system is based on infinite auction for the ad spaces which gives great deals for both. It is specially for blogs and this is the special thing about this platform and from last many years it has made good brand image and people consider this as reliable network for monetizing their blog and increasing earning also. For making money with this ad platform you can just install their WordPress plugin and start selling ad space on your blogs, creating ads and managing them is very easy because their created system is very user friendly so you can have complete control on your advertising work and make automated sales also. There is one more ad network with Qadabra which also deserve to check and you can try it also, If you find these buysellads alternatives useful then please share the post. Thanks.